Sto zvířat has been on the music scene for 15 years, during which time it has put on concerts around the world, filmed a documentary about itself, released five albums, produced ten videos, and recorded for Czech Television. 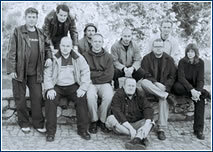 Today’s ten-member band includes only three musicians from the original group (Jan Kalina, Tomáš Belko, and vocalist Jana Jelínková). The rhythmic, darkly humorous lyrics of saxophonist Tomáš Belko are complemented by Jan Kalina on drums and Petr Ostrouchov with guitar and vocals. The group has invited the likes of Marek Eben, David Koller, Lenka Dusilová, and Miro Žbirka as guests at the Akropolis, and the list includes Dan Hůlka, leading Czech violinist Gabriela Demeterová, and Pavel Bobek. 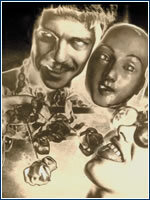 Milota Havránková (1945) was part of the local wave of so-called expressive surrealism. Then for a time she worked intensively in illustration photography, grandiose photography for interiors, design, and experimental film. It was characteristic of her to constantly track new technologies, experimentation, and free movement within the framework of sculpture, painting, textiles, and architecture. Since the revolution she has been working in an experimental studio at the College of Creative Arts in Bratislava. A selection of her works from 1965 to 2005 is on exhibit at the Gallery Art Factory. A rubik of danceDancer and choreographer Kristýna Lhotáková has again prepared a very powerful presentation based on a study of human behavior. This time she drew inspiration from Benešov native Ivana Gottliebová (1925) and her rich experiences in life: she was trained as a seamstress, but during WWII she traveled with a group of circus artists as an acrobat. She then studied at the Charles University School of Education and worked as a journalist, but after she left the party she made her living as a waitress. To this day she practices gymnastics at Sokol. Lhotáková (1977) has been concentrating on her own choreography since 1995. She lived and worked in Berlin and won international acclaim for her performance “Venus with a Rubik’s Cube”, in which a confrontation between a young dancer and an old woman creates a touching dialogue. As part of the Prague Theatrical Festival of the German Language, the Archa theater will present two performances. “Tin Soldier”, as presented at the famed Meiningen puppet theater is filled with symbolism and artistic frankness. H. C. Andersen’s tale of the heart and mind, of existence and appearance, is a beautiful metaphor for diversity. How much force must people who in some way deviate from the norm exert to stay in our society, next to us? 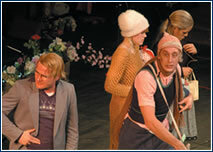 The other performance is a play by R. Schimmelpfenig as interpreted by the Bayerisches Staatsschauspiel München theater, “The Woman From Former Days”. The simple plot concerns a husband, a wife, and a teenage son right before they depart to the sea, apparently forever. Suddenly, from a seemingly dead past, a woman enters into the lives of this trio, claiming to be the man’s love from 20 years ago.